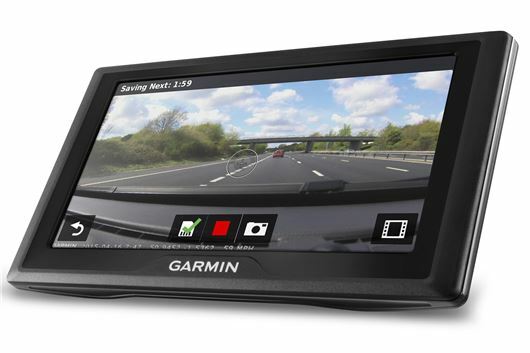 The next generation of Garmin “Drive” satellite navigation systems is to come with safety technology to improve situational awareness, including alerts about upcoming hazards such as tight corners and railway crossings, along with warning about traffic problems. Top models will come with a dash camera. Prices will start at £99.99 when sales begin in March. The Drive range will feature four different models – the Drive, DriveSmart, DriveAssist and DriveLuxe. Basic models come with navigation, FourSquare based POI information and alerts about potential hazards on the route ahead, but no traffic warnings. The navigation unit will also give directions based on recognisable land marks where possible, plus there are lifetime map updates. Upgrading to DriveSmart adds Bluetooth connectivity for phone calls, plus it enables drivers to set custom notifications on the nav screen for text message or apps. Additionally it adds traffic alert functionality, which will suggest alternative routes based on the traffic conditions ahead. The DriveAssist model includes a dash camera, which detects collisions and records footage. It also adds lane departure and front collision warning, plus a system that alerts a distracted driver if the car ahead pulls away in a traffic jam. The DriveLuxe model gains a high-quality forged metal case and magnetic mount system. The full range should be on sale in the UK from late March 2016.